/ Modified feb 27, 2015 4:09 p.m.
Festival of Books speaker shares her writing life, features local sites in her mystery stories. 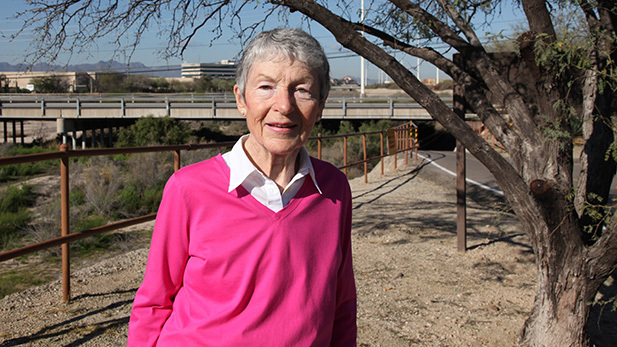 Elizabeth Gunn stands along the Rillito Riverbed and multi-use path. This is the opening scene in the first book in her Tucson mystery series. Elizabeth Gunn started writing mystery novels when she was 70 years old, after a career owning hotels and world travels in her retirement. "It's not a good life plan, or a good business plan, to wait that long," said Gunn, who is now 87. Yet, she has made it a second career, with a 10-book series featuring a detective in Minnesota and a five-book series featuring a Tucson police detective. She also has three books of short fiction and is starting a new series about an amateur sleuth in Montana. "It's a job, and it's a hard one," she said. "I have a routine. I write in the morning. I just get up and go to yoga or take a walk, eat breakfast and go to work. I believe deeply in that routine." It also takes a lot of studying. She visits police stations, books ride-alongs with police to see how crimes are investigated. "You really talk to a lot of cops," she said. "Policemen are all about rules, I have learned." She even gave up some quality of life to research, because she lost some of her hearing when learning to shoot a gun at a range in Tucson. Gunn wore ear protection, but had to remove it to hear answers when she had questions, and that's when her eardrums were subject to gunfire without an audio buffer. Gunn also researches the locations in her books. 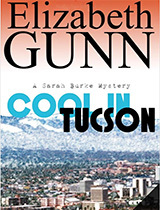 In the opening scene of the first Tucson mystery, one of the main characters thinks he is about to be killed along the Rillito River, so he takes an offensive defense. The river, she said, was a perfect spot for a middle-of-the-night murder. "It's a wonderful place," she said as bicyclists and joggers passed on a calm February morning. "But it keeps that air of strangeness, because it had a river and the river's gone, and then every so often the river comes roaring back. There are not very many places like this." Another favorite is Tucson Greyhound Park on South 4th Avenue, where Gunn's villains have business meetings. "As soon as I saw the place, I just knew I wanted to put it in the book, because it's this wonderful mix," she said. "Families come here on their day off, and there is no waitress service, so you go up to a counter, you get your food and drinks and whatever you want, and you go to a table. You can sit there for 15 minutes or all day." 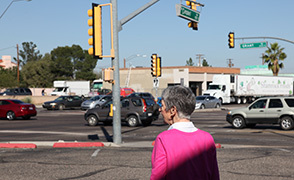 Tucson mystery author Elizabeth Gunn looks at the intersection of North Campbell Avenue and East Grant Road, where scenes from her book "Cool in Tucson" take place. The drawback to using real locations in a timeless book is they change. In Tucson, "we keep demolishing" buildings, she said. Standing at East Grant Road and North Campbell Avenue, Gunn explained that the Catalina Theater was the perfect place for one of her scenes. The "apprentice villain," as she calls one of her main characters, gets spooked and leaves another character at the theater. Across the street, the former CoffeeXchange is a place of refuge. Both businesses are gone now. "Every time you look around, a lot of things have changed, so that’s what I’m up against," she said. "If it’s a mountain, I can pretty much count on it still being there when the book is finished. If it’s a building, don’t count on it." Gunn also includes tidbits in her books that tug on local heartstrings. "In the last week of September, the summer rains had ended but the heat was hanging on - downtown would be sizzling by noon. It felt good to be outside in the pre-dawn hush, the thermometer at sixty five and small birds making optimistic noises in the dusty bushes," Gunn writes setting up a scene. She distinguishes between the routines of avoiding winter cold in her Minnesota series and avoiding summer heat in her Tucson series. And no Tucsonan can deny Gunn's connection to they area when she describes a sunrise. "It comes up in that huge, brassy ball that is here in the summer, and right away [the characters] get hot," she said, standing along the Rillito riverbed. Author J.A. Jance: Second-Grade Teacher Inspired Her A Day at the Voyager RV Resort Finding Common Ground with "One Small Step"